A rare case of third ventricular choroid plexus papilloma and associated complication of shunt ascites is described. We propose to convert shunt into ventricular drain in such a situation and reassess the requirement of shunt after complete tumor removal. 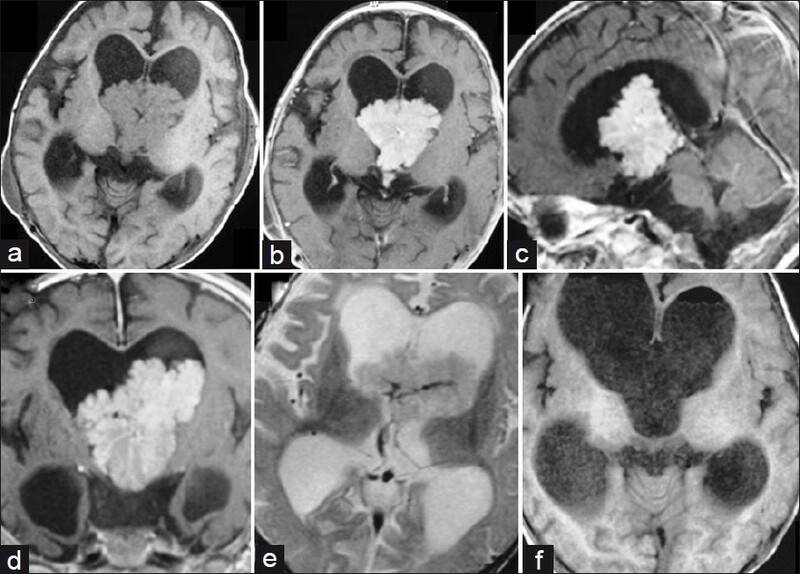 The present communication describes a rare case of a large third ventricular CPP, its radiological findings, and management problems and describes all reported management problems reported in the literature. A 7-month-old infant, born of full-term normal vaginal delivery, with normal developmental milestones, presented with complaints of poor feeding, lethargy, and altered sensorium for a weeks duration. There was history of increasing head size for the last 1 month. During examination, the child was crying, with no eye contact. Anterior fontanella was tense and bulging, with dilated veins shining on both temporal bones. Lateral gaze palsy and brisk deep tendon reflexes of knee joints were noted. A computerized tomography (CT) scan of head showed a mass lesion arising within the third ventricle, extending into both the lateral ventricles, with gross hydrocephalus. Magnetic resonance imaging (MRI) scan revealed similar findings and the antero-posterior extent of the tumor was well defined. There was intense contrast uptake by the tumor, on contrast administered MRI scans [Figure 1]. The infant underwent right-sided ventriculoperitoneal shunt. After initial improvement, on the seventh postshunt day, infant developed irritability and gross abdominal distension, with bulging fontenala. Abdominal ultrasonography suggested gross ascites. The lower end of the shunt tip was exteriorized and was maintained as ventricular drain so as to relieve intracranial and intra-abdominal pressures. Draining shunt tip was kept at the height of 10 cm of water, which continued to drain 800-1000 ml of CSF daily. Serum electrolytes were strictly monitored during the drainage period. On the 14th postshunt day, definitive surgery was performed through the left frontal craniotomy and trans-sulcal (trans-cortical route) approach. Complete excision of the soft, suckable, moderately vascular tumor was achieved. The ventricular part of the tumor was delivered into the left lateral ventricle through foramen of Monro which was grossly dilated to 5 cm. Immediately after surgery, the CSF drainage had decreased to near normal levels (15-20 ml/hour) and the exteriorized shunt could be removed on the second postoperative day. On the 10th postoperative day, the child was playful, accepting oral feeds, depressed fontanella, and good eye-contact. Postoperative CT scan showed no residual tumor or hydrocephalus. The histopathology of the excised tumor suggested choroid plexus papilloma. At 6 months of follow-up, MRI scans revealed totally excised tumor, with mild ventriculomegaly, but the child remains asymptomatic, with no bulging of fontanella. Choroid plexus papillomas (CPPs) are congenital intracranial tumors of neuro-ectodermal origin. They are most common in lateral ventricle, sometimes multiple, and rarely occur in third ventricle. Inherent to their location, third ventricular CPPs pose difficult management problems [Table 1]. Smaller tumors are difficult to detect and further, difficult to excise. Larger tumors tend to widen foramen of Monro, thereby spilling over into lateral ventricle, making surgical extirpation easy. Henceforth, larger tumors are surgically easily excisable via trans-ventricular route. Shunt ascites is a common management problem inherent to CPPs, reported frequently in the literature. , The normal CSF production (0.29-0.35 ml/min) was increased to 0.63 ml/min as these neoplasms continue to maintain normal physiological functions and are detected early in life, these are congenital in origin. The present case had 900--1000 ml/day of CSF output. However, older patients harboring such tumors are on records. It is interesting that the CSF dysbalance due to overproduction can be addressed if tumor hypertrophied CP excision is undertaken early in the course. If delay occurs in the removal of the lesion, the patient can be converted to shunt dependent within months of shunting. This can occur in the absence of hemorrhage, infection or metastatic spread that might cause CSF pathway obstruction secondarily. The reasons for the development of shunt dependence are not known. We propose that total tumor excision should be attempted after shunt exteriorization and then reassessed for shunt requirement. We agree that subarachnoid block continue to exist as a cause of hydrocephalus, but a significant number of patients may get rid of shunt systems for their entire lives. CPPs of third ventricle pose a difficult challenge due to their anatomical location and involvement of pediatric population. Shunt ascites in such cases is mainly attributed to overproduction of CSF and the management should best be tailored to attack the tumor, thereby avoiding the CSF shunting device, if possible. 1. Carson BS, Weingart JD, Guarnieri M, Fisher PG. Third ventricular choroid plexus papilloma with psychosis. Case report. J Neurosurg 1997;87:103-5. 2. Schijman E, Monges J, Raimondi AJ, Tomita T. Choroid plexus papillomas of the III ventricle in childhood. Their diagnosis and surgical management. Childs Nerv Syst 1990;6:331-4. 3. Do HM, Marx WF, Khanam H, Jensen ME. Choroid plexus papilloma of the third ventricle: Angiography, preoperative embolization, and histology. Neuroradiology 2001;43:503-6. 4. Nakano I, Kondo A, Iwasaki K. Choroid plexus papilloma in the posterior third ventricle: Case report. Neurosurgery 1997;40:1279-82. 5. Kumar R, Sahay S, Gaur B, Singh V. Ascites in ventriculoperitoneal shunt. Indian J Pediatr 2003;70:859-64. 6. Pawar SJ, Sharma RR, Mahapatra AK, Lad SD, Musa MM. Choroid plexus papilloma of the posterior third ventricle during infancy & childhood: Report of two cases with management morbidities. Neurol India 2003;51:379-82. 7. Pianetti Filho G, Fonseca LF, da Silva MC. Choroid plexus papilloma and Aicardi syndrome: Case report. Arq Neuropsiquiatr 2003;60:1008-10. Gupta, P., Sodhi, K.S., Mohindra, S., Das, A., Khandelwal, N.